Following the exciting trailer at the PS4 conference Ubisoft have released yet another trailer for the highly anticipated, Watch Dogs. This new trailer mimics the original in terms of the footage in the original trailer, however this one is filmed from the eye of the games eye in the sky, ctOS. The game has already amassed a very impressive following with hundreds of thousands of gamers eagerly tracking its progress. Very little information has been released outside of the Playstation 4 conference and original showing at E3 but the videos themselves have been enough to attract quite a bit of attention. 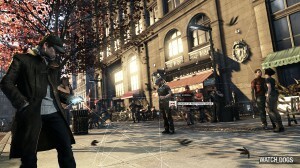 You take control of Aiden Pearce who has the rather useful ability to hack the city’s central operating system (ctOS) allowing the player to control and even destroy various technologies around them. In an ever increasing connected society players will be able to control everything from security cameras to traffic lights and vehicles. Ubisoft are on a roll with recent releases, such as Far Cry 3 and Assassins Creed III, earning critical acclaim across the globe. Watch Dogs already has the following to be one of the biggest launches this year and there’s no sign of it slowing.